The quilts & wall hangings presented here are only part of the total produced over the last 30+ years. Some of the quilts shown here are unfinished. Click on a thumbnail image below to see a larger view and then use your browser's BACK button to return to this page. Dresden plate design wall hanging. Material supplied by a friend. 54-50 or Fight design wall hanging to accompany the quilt on my bed. A cute wall hanging. Gave one to my daughter, Marita and one to my granddaughter, Jessica. 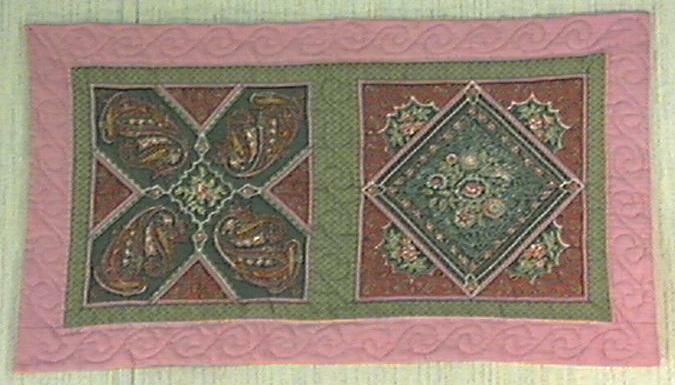 A Mid-Eastern design wall hanging with lost of quilting. A Snowball design quilt which was a lot of work to make. It is from scraps of new materials. 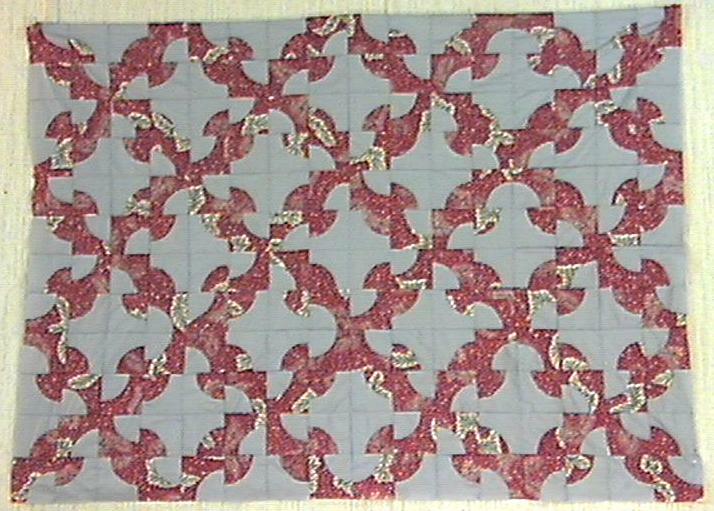 I didn't like it much after finishing the top and will probably put it on bottom of piles to be quilted. May come up with a design that will make it more acceptable to me. 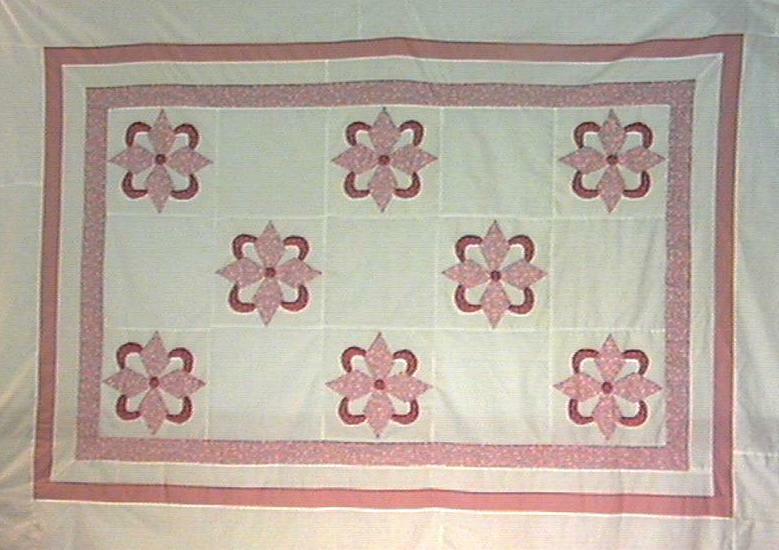 Full sized quilt, appliqued with various pinks. Quite pretty. 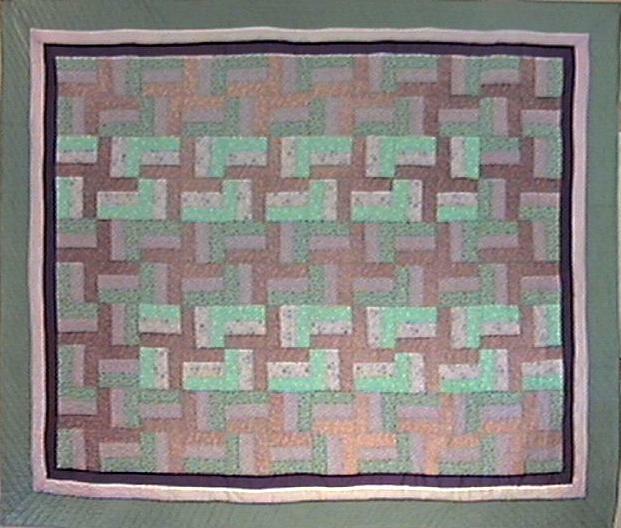 Awaits quilting (Nov 98). 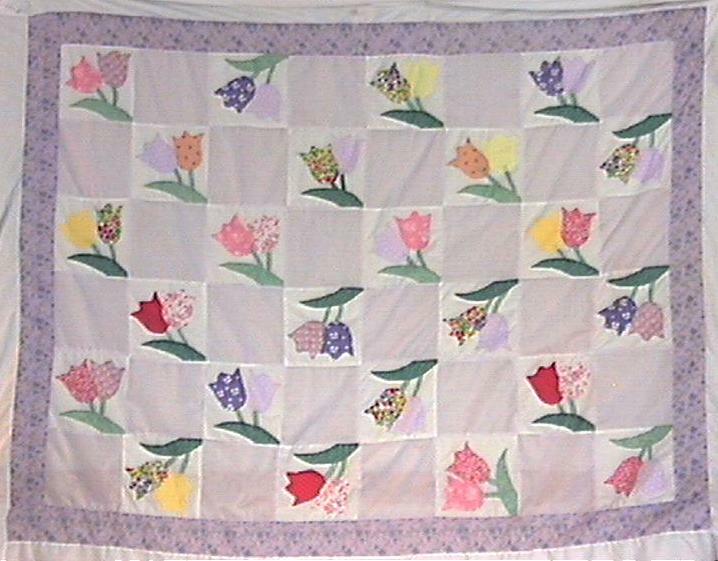 Full sized tulip applique quilt. I call it Springtime. 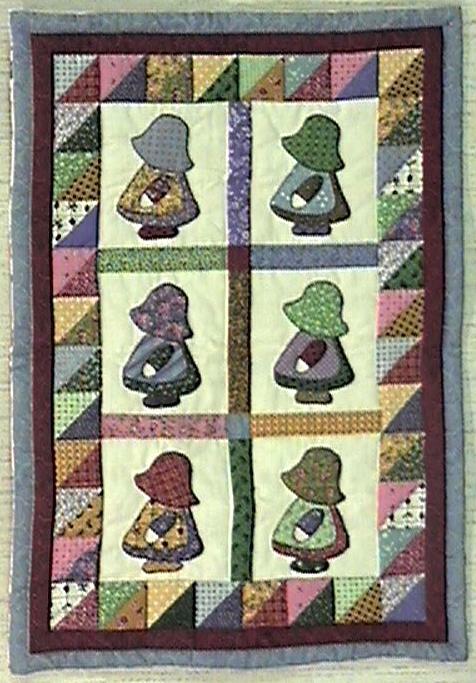 Awaits quilting (Nov 98). 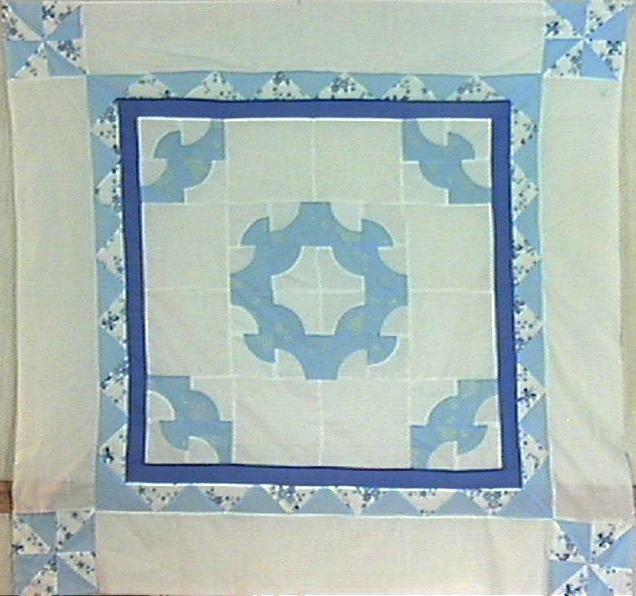 A blue and white quilt with birds made from a Drunkard's Path design. 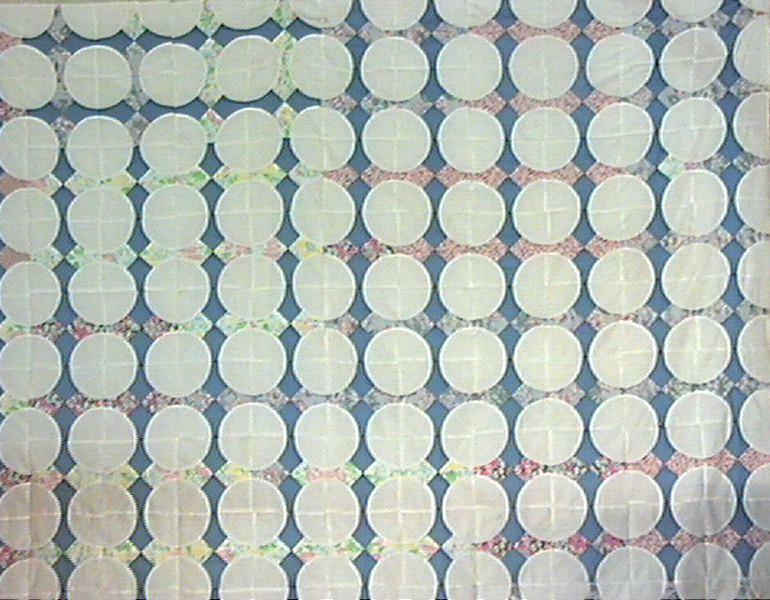 Quilting almost complete (Nov 98). A variation of the Drunkard's Path design. It is much prettier than this picture shows, a lovely red pring on gray. Unfinished (Nov 98). 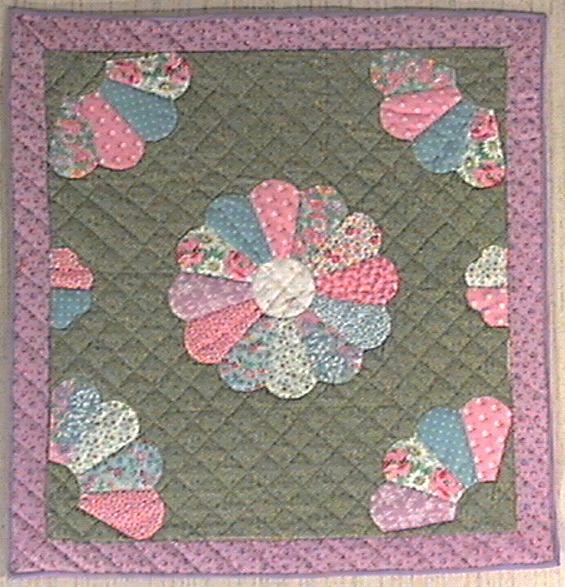 A small hand-pieced table cover. Made from scraps. This quilt has no name. I made it just using materials on hand. It is all hand quilted as all of my quilts are. 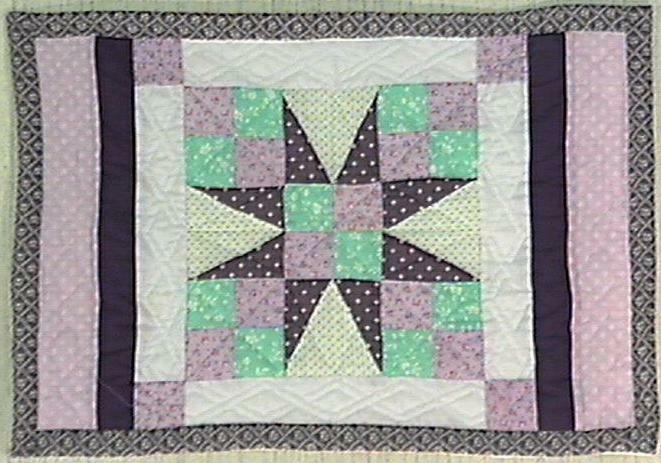 It is done in lavender, green and purple prints. I have it on my bed. 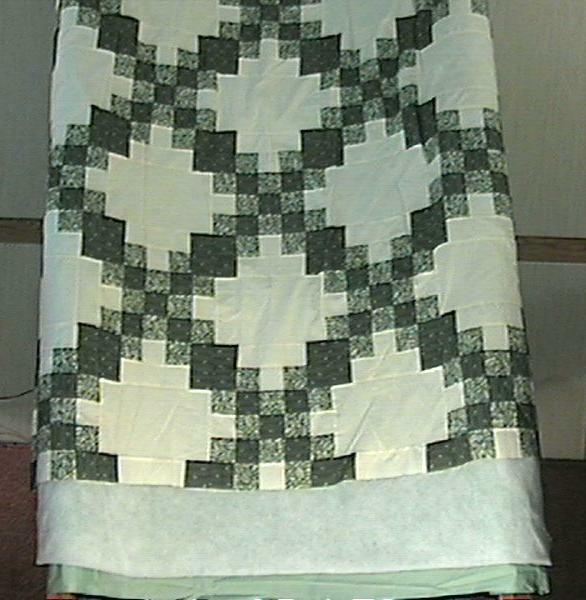 This is the first quilt I ever made. It is appliqued with materials used from old dresses and skirts of mine, because I didn't have money to buy materials. 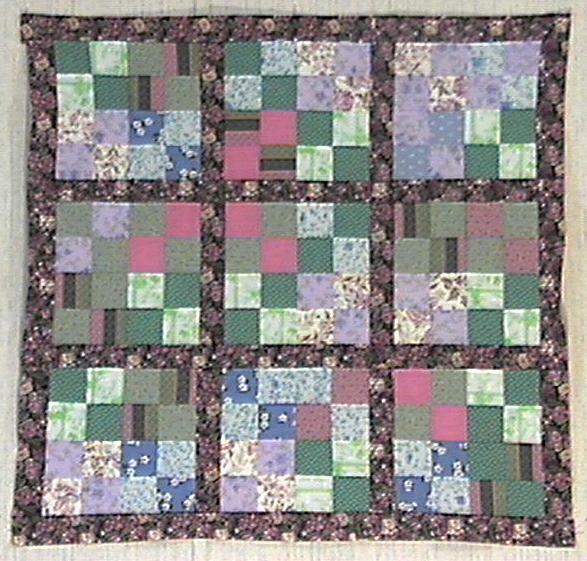 It is made by quilting each block separately on lap because I had no frame. I really didn't know much about making a quilt and it has lots of mistakes in it. 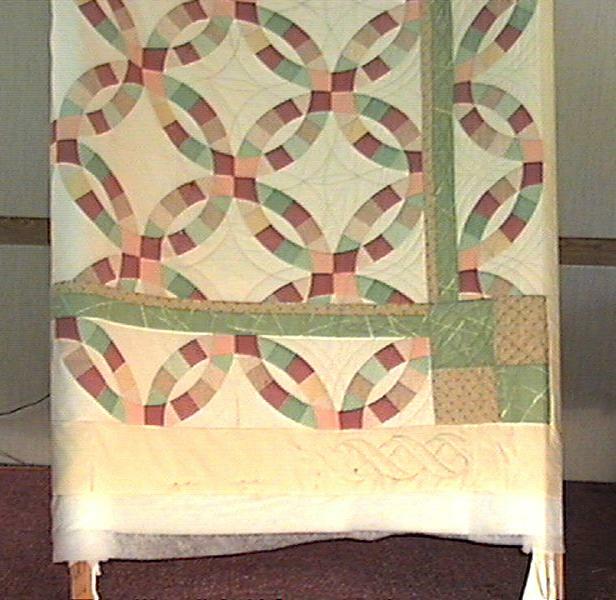 A Double Wedding Ring design on frame being quilted (Nov 89). A Double Irish Chain in two shades of green. 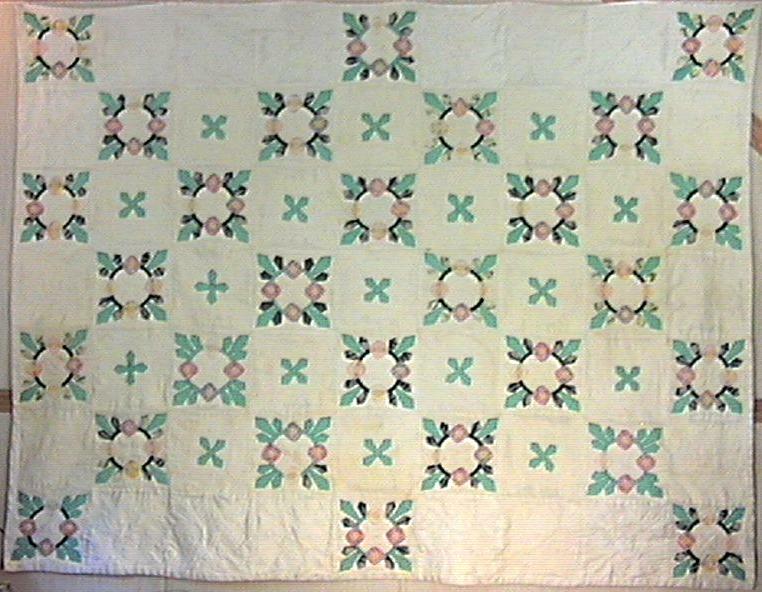 It is presently on the frame being quilted (Nov 98). 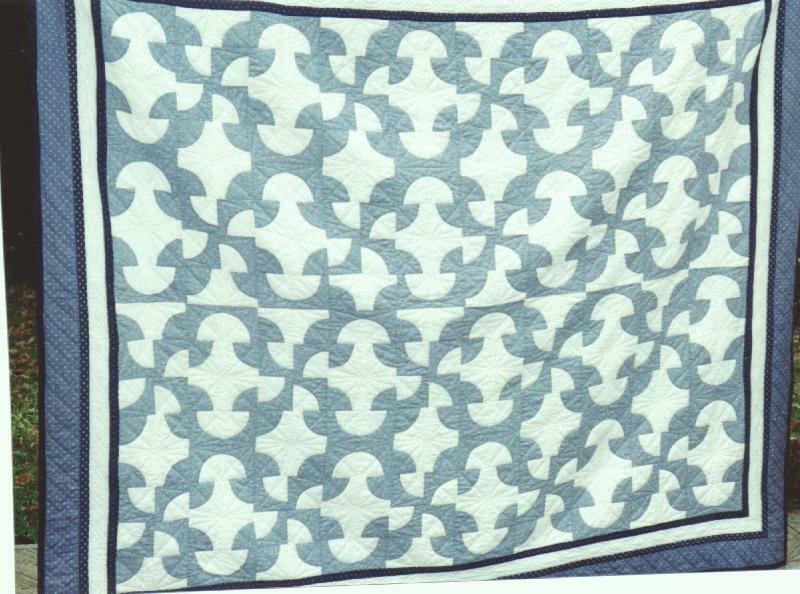 A Pumpkin Vine quilt in blue and white using a Drunkard's Path pattern. It was difficult keeping the pattern organized. It is an over-sized quilt for a queen size bed (80" X 96") made for my son, Lynn, Jr.
A multi-colored Double Irish Chain queen-sized quilt for Marita. Be careful of your quilts, they are easily stolen. I made one for my granddaughter, Jessica. She and her mother were returning home to south Florida by train. They went to the dining car and when they returned the quilt had disappeared. They are also know to be stolen from the mail. Don't mark what they are.